Formerly it was the ancient capital of Colchis and Imeretia kingdoms. Today it is the second largest and significant city in Georgia. Kutaisi is located in the Rioni river valley on Colchis lowland. The river Rioni is mentioned in the myths of the Golden Fleece for a reason: local residents used to extract old there. They put their sheep skins across the flow and waited for a few hours and then combed out gold dust from them. The symbol of a sheep skin covered with gold was later named the Golden Fleece. This rich fertile river valley sated with cold springs, and magnificent green woods became the centre of the ancient Colchis kingdom with Kutaisi as its capital (from the 780s). From the end of the 10 th century until the time when Tiflis was free from Seljuks Kutaisi was the capital of the united Georgian kingdom and for about 150 years carried out this honorable mission. In the end of the 15 th century Imeretian area was singled out from Georgian state as independent Imeretia kingdom with the capital in Kutaisi. In the 17th century it conquered by Turks, in the 18th century it was set free by Russian armies. And in 1810 Imeretian kingdom was a part of Russian empire as Imeretian area. In the beginning of the 20 th century it was a silent provincial little town. For the years of the Soviet power Kutaisi turned into a large industrial centre of the republic. Today there is practically no industry there but Kutaisi remains is still the second important city of the country – the regional center of Imeretia with about 200 thousand inhabitants. The city has managed to save the outlines of medieval architecture and buildings as well as winding streets and lanes. The city stretches on both banks of the Rioni which is decorated with the bridges unique in their structures and beauty. They distinguish Kutaisi due to their originality and dissimilarity from other cities. The old right-bank part of the city is the more interesting. There you will find 1-2-storey houses with hanging glazed verandahs standing above one another on the steep slopes buried in verdure. Nearby there are tremendous medieval temples: Helati, in which David the Builder was buried, dilapidated but nevertheless working Bagrat Temple. These temples are protected as objects of the World Legacy by UNESCO. “> This majestic cathedral is towering over Kutaisi and visible from any point of the city. Bagrat Temple, the greatest culture and architecture monument of Georgia, was constructed in the 10 th – 11 th centuries in the days of Bagrat III, a Georgian tsar (975-1014), the progenitor of the Bagrationi princes. Only the temple ruins have been saved on Ukemerioni hill near Kutaisi. The temple consecrated in the honor of the Assumption of the Virgin, was in fact a palace-temple complex, the cultural and religious centre of its time in which all considerable events were marked, all intellectual life of the state was concentrated. The cathedral had not only spiritual mission but also was a symbol of the united Georgian people. And there is an explanation to that: in the 11 th century David the Builder, the tsar who united Georgia , was crowned there. The temple was intact until the 17 th century (when it was destroyed by Turks) and according to the ambassadors of Russian tsar Alexey Romanov it was all covered with frescos and mosaics. Then in the 17 th century the temple roof was heavily damaged it was practically taken down. All the rest is in a very good condition: the walls, a part of the arches and the altar part. Due to this the church services continued there, in the open air. Bagrat Temple is one of the best samples of late medieval architecture. It is distinguished by refined, harmonious proportions, and graceful decor. This is a square building in the shape of a cross. The front entrance is decorated by a portico. The capitals were covered by stucco moldings, the walls and the floor – by still visible mosaic fragments. In the southern lobby the fragments of fresco of the Virgin can be seen. The northern wall of the temple bears the inscription of the construction date – 1003. From the inside the temple looks like a regular church – icons, candlesticks, an altar. The ornament and bas-reliefs of Bagrat Temple are similar to the filigree of ancient jewelers. In 1994 the Bagrat Temple Revival Fund was established in Kutaisi . Today the temple is in the list of the world-significant historical and cultural monuments of UNESCO. It is a small and very beautiful monastery with round turrets crowned with peaked tent-shaped domes. The monastery is standing above the rough Rioni river and is buried in coastal vegetation. According to the legend the monastery was constructed on the place where Muslim aggressors executed David and Konstantin Mkheidze, Georgian princes, who refused to accept Islam. In a small monastery hall on an eminence there is a big rectangular ark with the hallows of the pious princes canonized by Georgian Church . Motsameta attracts crowds of tourists with an ancient superstition: if one crawls three times under the ark and makes a wish while touching the hallows, the princes David and Konstantin will grant it. The Tsar Bagrat III reconstructed the church in the 10 th century. The building was reconstructed again in the 19 th century. This perfectly restored outstanding monument of Georgian architecture was the centre of spiritual and scientific life of the Middle Ages, the tomb of Georgian tsars, the cult place for pilgrims. 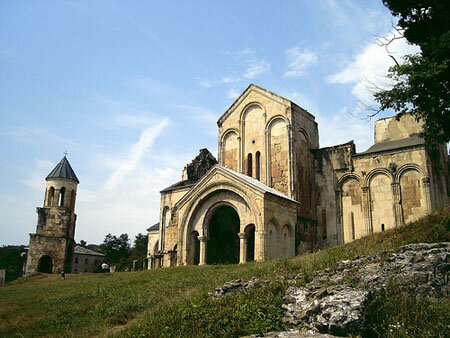 It is located 1 km from the city of Kutaisi and is under UNESCO protection as an object of cultural and historical legacy. In fact Helati is a rich historical architectural complex comprising the ancient monastery, the bell tower, the church and the academy set up in 1106 by the great tsar of Georgia David the Builder. Thus, Helati was not only the spiritual centre of the country but also the largest centre of culture, history and science. David the Builder, who wanted to create a large educational centre in his country, gathered the best Georgian scientists in the academy. In Helati there was a big and rich library, the teachers and scientists in the academy were the most educated people of the time. The main structure of the complex is the church of Assumption of the Virgin. This temple keeps well-known Helatian mosaics and frescos dated the 12 th – 18 th centuries. The most valuable are the paintings with the images of the Mother of God. On the northern wall of the temple there is a fresco with the image of David the Builder. Beside those Helati complex includes St. George the Victory-Bearer cross-dome church (the 13 th century) which is a smaller replica of the main Helati temple. The church has 16 th- century frescos. The two-level St. Nicolas Miracle-Worker church is also a part of the complex. … Here the short history of Helati. From the 12 th to the 14 th centuries the monastery was the property of the Tsar’s house. Tsar David granted it enormous grounds and generous treasures – the trophies of the victorious wars. The monastery was the place where such religious relics of entire Christian world as Khakhul icon of Divine Mother and the Atskur icon of Divine Mother along with ancient manuscripts and many other relics were kept. Tsar David ordered to arrange a tomb for the representatives of imperial family n the monastery. Nearly all tsars of united Georgia are buried there: Demetre I, George III and presumably Queen Tamara. David the Builder ordered to bury him in such a way that everyone entering the tomb would step on his ashes. The legend says that it was how the tsar wanted to be punished for being arrogant. Now the ashes of the tsar are resting under the southern gate of the temple and everyone who enters the temple has no other choice but stepping on his tomb. There is also the tomb of Imeretian tsars since after the disintegration of the united state the monastery was in their possession. In 1510 Helati was burnt by Turkish aggressors. After that the tsars of Imeretia Bagrat III and George II thoroughly repaired the monastery. Afterwards the residence of the Catholikos was transferred from Bichvinta to Helati in the second half of the 16 th century (until the 19 th century). In the 17 th century the monastery was renovated again. After Imeretian kingdom joined Russia Helati ceased to be the church possession and became a state property. Not far from Kutaisi there is a unique Sataplia Reserve skillfully hidden in the mountains. The reserve became well-known a big karstic cave with the underground small river, stalactites and stalagmites (millennia-old) and the Dinosaur Plateau with real traces of ancient reptiles printed in huge stones were found there in 1925. There are a lot of such traces and they clearly visible. Sataplia is the third place in the CIS with dinosaur traces after Ravat gorge in Tajikistan and Hodzha-pil in Turkmenistan.